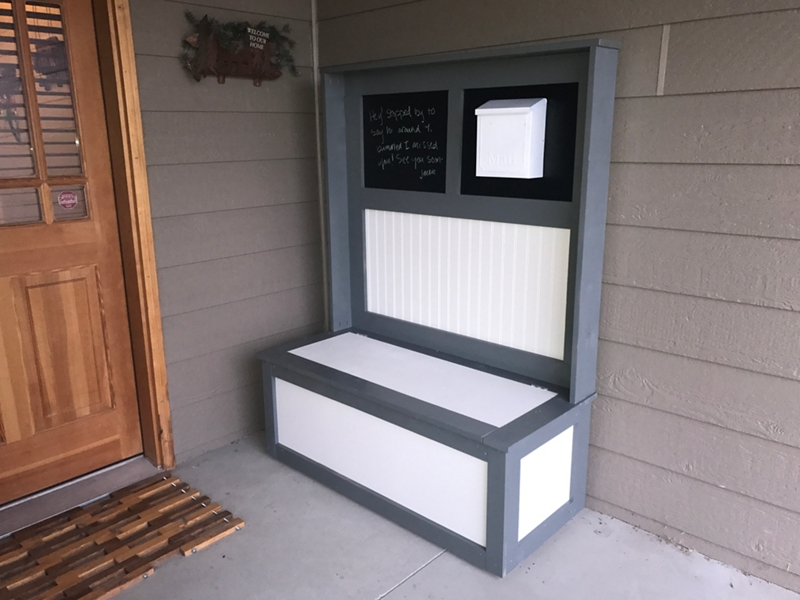 A multi-purpose hutch painted with netural Krylon® colors is a great addition to your front porch! Start by cutting the panels that will form the chest. You will need to cut the bottom/base from plywood measured, marked, and cut to 44 ½" long x 18 ½" wide x ¾" thick. Use a circular saw or table saw and always wear protective equipment. Cut the sides of the chest by measuring and sawing 1X4 wood boards into two 18 ½" x 2 ½" x ¾" pieces and 1X3 wood boards into two pieces measuring 18 ½" x 2 ½" x ¾". To begin assembling the chest portion of the project, attach each panel together by using pocket holes and wood screws. Set the pocket hole jig to the ¾ inch stock setting. Wood glue should be used at all joints for added strength. Drill pocket holes all around one side of bottom/base of the chest. This is how it will be attached from the underside. Drill pocket holes on three edges of one face of each of the four sides panels. This is how they will be attached together. Pocket holes are only made on the end boards. 1 ¼ inch long pocket hole screws attach the panels. Add the lid support by attaching them from the underside using pocket holes. These boards will attach to the back, left, and right sides of the chest and help strengthen the chest and provide support for the chest lid. Add the feet by attaching the four 3 ½" x 3 ½" x ¾ pieces that were cut from the 1X4 boards on the underside of the box. They should be inset approximately ¾" from both edges. The feet will keep the plywood off the ground and help prevent water damage. Cut the trim to size referenced above using a miter saw. Temporarily attach it to the box to make sure everything is cut to the correct size. This step is not absolutely necessary, but recommended as it will ensure the boards fit properly when it comes to the final install. Only attach with a couple of nails since the trimmed will be removed to paint. The lid surround will go around three sides on the top of the chest and will attach after painting. The upper section is built out of 1x6 and 1x4 boards. Assemble the outer frame first. Add 1x4 boards around the perimeter to strengthen the frame. Set them in about ¼ to ½ inch from the backside of the unit. This will create a lip and the spacing needed to attach the chalk board and bead board. Construct the top frame by using pocket holes on the rear of all top frame boards to attach them from behind the hutch. Attach 2x6 boards to the outside of the frame. They should be overhang in the rear by ½". There should be ½" overhang on either side of the top board. Cut the chalkboard and beadboard to size. Dry fit the beadboard and chalkboard to double check that they fit correctly, but do not adhere until after painting. Sand the furniture prior to painting using 120 or 220 grit sandpaper. Remove the temporary trim and remove nails to prepare for painting. Ensure you are in a well-ventilated area before you spray paint. Always read the label for proper safety and application instructions. Use Krylon® COLORmaxx™ in Gloss Ivory to paint the beadboard, the seat of the chest, the front of the chest, and the sides of the chest. Use three coats for the pictured look. Use three coast of Krylon® COLORmaxx™ in Gloss Machinery Gray on the various pieces of trim to achieve the pictured look. Once the paint is fully dried, attach the painted trim to the chest. Attach the trim that forms around the lid. Use wood glue and screws. Make the lid by connecting the trim board to the front of the plywood lid. Connect the hinges with ¾ inch long screws. Use one hinge on each end. A lid support can be attached to one side. This will keep the lid open while putting items in the chest. Connect the chalkboard and beadboard from the backside using ¾ inch screws. Enjoy your hutch - it can be used as a message board, mail area, and for delivered packages!